Day 1: Grow the HubPot Challenge Results! Hello Hubbers! The first day of the Grow the HubPot Challenge is completed, and we are really excited with the results. While it was extremely difficult choosing the top 10, we think we have found some gems! 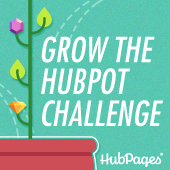 The contest will run until midnight (PT) on March 2nd – so keep on Hubbing and growing the HubPot! aa lite: What are Fractals? How is Maths Used to Make Art? beckisgiftguides: Why Do We Celebrate Easter with Eggs and Rabbits? Congratulations, Virginia! Your winnings of $22.50 have been added to your HubPages Earnings balance! Well done, Everyone! Hubbers, starting today there is an exciting new way to earn from Amazon products on your Hubs: the HubPages Amazon Program. Some of you may recall talk of the Amazon Program way back in late 2011, when we originally hoped to launch it. Unfortunately, we had to pause development work at the time, but we are very excited to finally be able to offer the program to HubPages Earnings Program participants! Hubbers who participate in the HubPages Earnings Program now (or are eligible to) have the option to earn from Amazon products directly through HubPages. The program will track referrals from your Hubs and the resulting purchase activity on Amazon. You will accrue into your HubPages Earnings Program balance from this activity, based on a commission from transactions on Amazon that occur after a referral from your Hubs. The Amazon Program offers a very high Amazon commission tier because the volume of sales across HubPages is aggregated for the benefit of the entire community. Because of this, most Hubbers will earn more via the Amazon Program than they would on their own. Another advantage to switching is that earnings across the Ad, eBay, and Amazon Programs will be consolidated, helping you reach the $50 payout threshold faster. I already have my own Amazon Associates ID linked on HubPages. What will happen to that? We understand that some users may prefer to earn from Amazon directly, which is why transitioning to the HubPages Amazon Program is not mandatory. We do, however, encourage you to consider switching to the Amazon Program if you *do not* currently earn at a high Amazon commission tier. I already have Amazon Capsules published. Do I need to edit those? No editing of existing Amazon Capsules will be required. HubPages will take care of all the back-end work to make sure that the Amazon Capsules you have already published transition correctly with no additional work required on your part. Amazon links created via the Amazon tab in the Text Capsule linking tool will automatically be updated with your HubPages-issued affiliate ID. Amazon links added ad hoc (copied and pasted from the Amazon site) will not. Please note: due to caching, the affilliate IDs across all of your Hubs may not switch immediately. Please allow up to four hours for the conversion process to complete. How do payments work for the Amazon Program? Earnings for the Amazon Program will be pooled together with earnings from the Ad and eBay Programs to help you reach the $50 payout threshold faster. However, Amazon Program earnings will be credited to your HEP balance a month later than the Ad and eBay Program. The reason for this is to protect ourselves and the community from fraudulent practices that have the potential to arise with a shorter payment cycle. What about open balances with Amazon if I switch? Open balances with Amazon after the switch will be paid out per the Amazon Associates Program guidelines. Note that if you are using your personal Amazon Associates ID elsewhere on the web beyond HubPages, such activity may still contribute to your balance in that external account. Can I switch back to my personal Amazon Associates ID after signing up for the Amazon Program under the HubPages Earnings Program? May I use my HubPages-assigned Amazon ID outside of HubPages? No. The ID that HubPages assigns to your HubPages Earnings Program account is authorized for use only on HubPages. You are not permitted to use it off of HubPages or to provide it to others as downstream affiliates of you. I am already enrolled in the HubPages Earnings Program. I am already part of the Amazon Associates Program via my own affiliate code. What are my options? Your personal Amazon Associates ID will continue to work. You can switch now to participate under HubPages and take advantage of the high commission tier provided by HubPages. You will be able to switch back to your own Amazon Associates ID at any time. I am not enrolled in the HubPages Earnings Program. I am already part of the Amazon Associates Program. What are my options? Your personal Amazon Associates ID will continue to work. If you would like to participate in the HubPages Amazon Program and get the high commission tier, you will need to sign-up for a HubPages Earnings Program account. Note that while you do not need to participate in the Ad Program in order to participate in the Amazon Program, you do need remain in good standing with HubPages and compliant with any rules that may be set by Amazon. This includes having an up-to-date account in the HubPages Earnings Program. I am already enrolled in the HubPages Earnings Program. I do not want to join the Amazon Program. What do I need to do? You do not need to take any action. The default status for the Amazon Program is “off”. We encourage you to stop by our main FAQ to learn even more about the Program and visit the official Forum announcement where you can ask questions and report bugs. We hope you enjoy the Amazon Program!